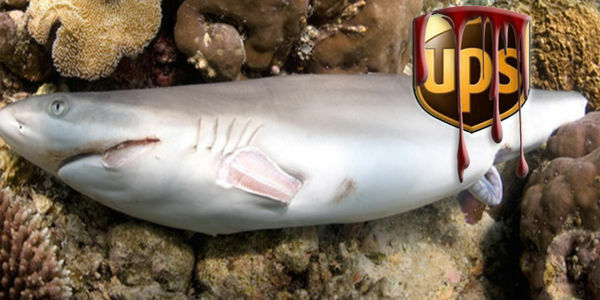 petition: TELL UPS NOT TO SHIP SHARK FINS!!! TELL UPS NOT TO SHIP SHARK FINS!!! 100 million sharks are killed every year, many slaughtered just for their fins and then thrown back to the sea to slowly die. The primary reason this is happening? The demand for shark fin soup! Shark populations are declining around the globe, with over 140 species of sharks listed as endangered, threatened, or near threatened by extinction. Shark fishermen and the shark fin trade have been dealt a blow recently by American Airlines who publicly acknowledge that they will no longer be shipping shark fins, a great win for sharks. Now is the time to prevent another huge transporter, UPS from picking up where American Airlines left off. Make a difference and help save our oceans by speaking up and signing this petition to tell UPS not to ship shark fins. You can learn more about Chris, his dives with sharks, and his efforts to protect them by watching our video. Click the image above, or visit this website: Shark Finning: How This Diver is Saving the Sharks. As the world's largest package delivery corporation, you have an important opportunity to help protect marine wildlife. Please update your shipping policies to explicitly ban the transport of shark fins. Please educate your workforce to the threat these often illegal products provide, and help shut down the shark fin trade. These simple steps would protect and restore shark populations, and make your corporation a global leader in shark conservation. Big news UPS has just banned Shark Fin. We Congratulate UPS on solving the problem internally, and for their environmental stewardship. A huge thank you to everyone that took action and signed this petition and all the groups that worked together to make this possible. Here's the current list of cities around the world who have pledged to organise a street protest against UPS to call on them to stop shipping shark fin.